That was the starting point to one story of restorative justice. The concept has been slow to catch on in a legal system that features capital punishment, life sentences without parole, mandatory minimum sentences, “three strikes” laws, private prisons and the abolition in some places of time off for good behavior. But it may be the next big thing in criminal justice. So what’s the rest of that story? How did that startling quote come to be uttered? The story started at Kolbe House in Chicago, a former convent one block from an open-air drug market. Precious Blood Father David Kelly, director of the of his order’s Precious Blood Ministry of Reconciliation, shelters at-risk teens there. One such teen was at “home” there when the doorbell rang. He answered the door and was stabbed repeatedly. An ambulance was called, which rushed the teen — with Father Kelly as a passenger at his side — to the hospital. The teenager’s life was saved. When he felt strong enough, police visited him with a book of mug shots in hopes that the boy could identify his attacker. He did. The police moved in to arrest the suspect. The issue that prompted the knifing wasn’t drugs. “It was a boy-girl thing,” Father Kelly said. Upon leaving the hospital, Father Kelly went to the Chicago jail, where the young suspect was already in custody. Upon seeing the priest, the lad uttered the words that began this story. It turned out Father Kelly knew him as well. And making things right between victims and perpetrators of crimes — or at least better — regardless of the judicial outcome is a key aim in restorative justice. Most work in restorative justice is done within the private sector. The state of Vermont is one of the rare governments with a restorative justice system, although its work is limited to after a convict is released from prison. About 60 participants focused on restorative justice at a Nov. 21 conference in Washington at The Catholic University of America. It was sponsored by the Catholic Mobilizing Network to End the Use of the Death Penalty; the U.S. bishops’ Committee on Domestic Justice and Human Development; the Institute for Policy Research & Catholic Studies at Catholic University; Mount St. Mary’s University; and the National Religious Campaign Against Torture. The situation is only going to grow more acute, as the nation’s prison population peaked earlier this year at 2.4 million, said Father Michael Bryant, a priest of the Archdiocese of Washington who helped in the preparation of the U.S. bishops’ 2000 document “Responsibility, Rehabilitation and Restoration: A Catholic Perspective on Crime and Criminal Justice.” The priest also founded a “welcome home” program for released prisoners. Retired Bishop Ricardo Ramirez of Las Cruces, New Mexico, called for an updating of the 2000 document during the conference. Significant questions need to be addressed on how the country can absorb an influx of “returning citizens,” as released prisoners are called by some activists in the field, without them getting a return trip to jail because they’ve received no life skills while in prison and have little recourse but to go back to the street life that got them in jail in the first place. States are finding out they simply can’t afford to keep so many prisoners locked up and are looking for ways to thin out the prison population, possibly starting with nonviolent drug offenders. Private prisons have not done as much as expected in terms of cutting state costs. They also tend to be farther from the inmates’ homes, increasing convicts’ sense of isolation as it becomes too difficult for family to visit. But if states shut down prisons, that will have a negative economic effect on the small towns that often have been the sites of recent prison building. The challenges are daunting. But Heather Rice-Minus, a senior policy adviser for Justice Fellowship, the advocacy arm of Prison Fellowship Ministries, called prison reform one of five issues that could be achieved by the next Congress working in a bipartisan spirit. Catholics were called upon during the conference to practice restorative justice. Anthony Granado, a domestic policy adviser for the U.S. bishops, noted that the Latin word “pontifex” means bridge-builder. “I want you to continue to be bridge-builders, pontifexes,” he said. “We have 5 percent of the world’s population and 25 percent of its imprisoned,” said Karen Clifton, executive director of the Catholic Mobilizing Network. She reminded conference participants of the model set by Pope Francis, “a pope with his powerful words” — and deeds, as last year on Holy Thursday he went to an Italian prison to wash the feet of both male and female inmates. Ford Rowan, an Episcopalian and a volunteer for 15 years in the ecumenical Kairos Prison Ministry, admitted as much. “We’re in the healing business, and it’s not an easy task,” he said. “Wow! That’s the fastest discernment ever,” Rowan said he thought, before asking the woman, “What’s Kairos?” “Prison ministry,” she answered. 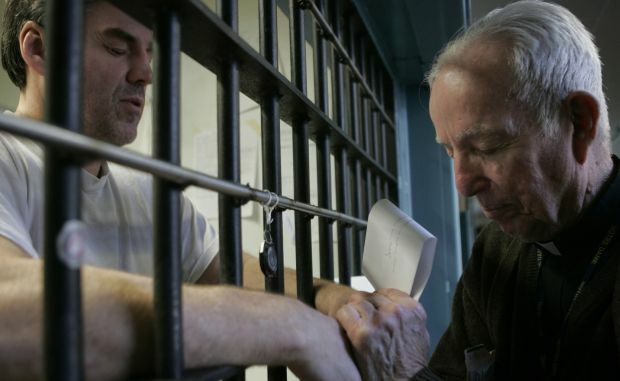 John Sage, founder of the Bridges to Life program, which has “graduated” 22,000 inmates since 2000, said he found a payoff in one prison prayer circle he led. One inmate was a devoted participant, yet he refused to recite aloud that part of the Our Father that says, “Forgive us our sins as we forgive those who sin against us.” Why? The inmate told Sage he had promised his dying brother he would kill the man who had murdered him. This inmate’s cellmate got a sudden transfer notice, a practice common in prisons. As the cellmate left the cell for processing, he had left behind some documents. Among the documents were papers registering the cellmate’s conviction for the murder of the inmate’s brother. The inmate, deprived of this knowledge for all the time he shared a cell with his brother’s killer, was now confronted with the opportunity to make good on his promise. But he ultimately chose to not kill the man. His reason, Sage said: “I didn’t want to disappoint the guys” in the prayer circle. Sage said the legal system deals even more harshly with prison murders than others — especially in states with the death penalty, like Texas, where this episode took place. But instead of spending the rest of his life, and possibly a much shortened life, behind bars, the inmate was eventually released and is now counseling young men on how to make the right choices. An interesting and timely article. However, the real challenge in my opinion is not just victim forgiveness. That’s morally good, but in our country if once forgiving is accomplished between perpetrator and victim, the convict is likely to return to crime. The rate of recidivism bears this out I think. The real problem I believe is that rehabilitation tends to be a shibboleth to ease the public concern about crime. When a convict has done his, or her, time, and assuming an honest good intention, a willingness to work and stay sober, if that’s a need (and is in the great majority of cases) the parolee falls into a system that’s understaffed, under budgeted, and unconnected. Simply, the con can’t find work. Not through a lack of willingness but because if one has a record an employer will not look beyond that fact. They will not take a chance. It matters not that the parolee may be highly qualified, very motivated and truly reformed. So, even if the parolee is without family obligations, a living wage is just not available – so what to do? Return to what they know – the street, the drug, the crime. The court costs and restitution etc. just add to the burden, just though they may be. I’ll stop. There’s more to be said, but I’ve already taken up to much of your time. Incidentally I’m not an ex-con. I minister some to prisoners. If we’re going to continue to be among the world’s leaders of incarceration the we really need to find ways to get reasonable employment to those “who’ve done their time”. It can be done.